When fans of Walt Disney World are looking to get a little of the magic at home these days, it is fairly easy. In these days of electronic media the choices abound, podcasts, music files, torrent files, online Disney Radio stations and more. Back in the day though, fans of The World had far fewer options. If it was music you sought, vinyl was the way to go (and perhaps the odd 8 track, which we will not discuss here because it says a little too much about my age). If it was the sounds of the theme parks you wanted to hear, you really had one option, The Official Album of Disneyland/Walt Disney World. Released way back in 1980, The Official Album, would bring all of the music and sounds of the theme parks right into your home. Starting with a nearly full-length recording of The Main Street Electrical Parade, the album was one of the few ways Disney Geeks were able to “get their fix.” With music from parades, attractions and even some lesser know performances, it was chock full of magic that you could take home with you to enjoy. As a young boy, my brothers and I would sit for hours listening to the album again and again. When it came time for our annual Disney World vacation, I can remember the look on the faces of other guests as three little boys, aged 5 thru 9, could recite, word for word, the entire Country Bear Jamboree (maybe it was annoying to some, like my Dad, but that never stopped us back then). We were in “our” Kingdom, we had waited all year to get back and we were going to “flex the golden pipes,” at least that’s how we looked at our renditions of the songs. Oddly enough, it seems as though my parents’ memories differ, I suppose we will have to agree to disagree then. I still today have my original copy of the album, these days it is now framed and on the wall in my den. Whether it is the difficulty in finding a record player to listen to it, or the fact that it is flat out worn smooth, I rarely get to listen to the album. Yet, to hear it, I need only close my eyes and there it is. In this day of instant access to nearly every musical note offered in the whole of Walt Disney World, this album will now and always stand as a testament to the origin of my own “Disney Fandom”…never to be forgotten. Great! This makes me wish I had held on to more things from the early days. I do have a letter opener from 1972 and an old Mary Poppins film soundtrack album around here somewhere. I need to find that album. One question though Tony, can you get this through iTunes? I've checked iTunes, Amazon, eMusic, and even a few of the web's more shadowy corners, but I haven't found a thing yet. Looks like Disney hasn't made a digital version available yet, unless its contents have been folded into one of the other official park-music sets. I picked up this album at Disneyland back in maybe 1981 or 1983. It's still almost brand new and plays as such, with barely a hint of any noise at all. It also has the original plastic wrap and price sticker of $5.98. I feel pretty lucky. It's still available through Amazon vendors and eBay, and elsewhere. It has a very good variety of cuts that no longer find their way onto current and recent years' single or double-CD sets. I don't think there is a single-CD set that will give us Mr. Lincoln, America Sings, a 6-minute MSEP, Country Bear Jamboree, and lots of Main Street music. Of course, Disney parks have changed quite a bit since 1980. 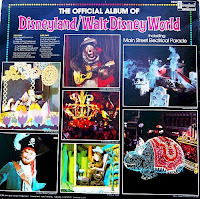 Aside from Disney's 2005 6-CD/book set (A Musical History of Disneyland), this vinyl LP is probably the only recording to give us this kind of a collection of historical Disney park material. If you can get one, do it. I recently came across this album in a closet left over from my childhood. Appears to have very few scratches and has been stored in its original cardboard and paper sleeves for years. Would love to seel it to someone who would value it in their collection. Also found Original Mickey Mouse Disco and The Mouse Factory.